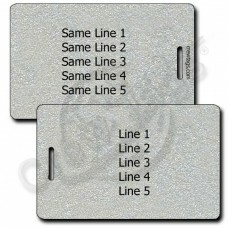 If you are into Silver, these luggage tags are or you! They might not increase in value like the precious metal, but they will be priceless when you need to get your stuff back. We have Silver Plastic Luggage Tags printed with your own information directly on the tag. They are simply the easiest, fastest and best way to spot your bag on a wherever you might choose to travel.